Looking for a different way to review math problems? The Rock 'n' Roll strategy encourages students to explore the different aspects of the problem-solving process when reviewing math problems. This is a great strategy for reviewing test questions or reviews that have multiple-choice answers. This strategy works best for reviewing a few problems, maybe the most missed ones from an assessment or review, but it’s very effective. Click here or on the image above to grab a free copy of my “Rock 'n' Roll Math” printables. You can read more about how to use the "Rock 'n' Roll Math" strategy here. 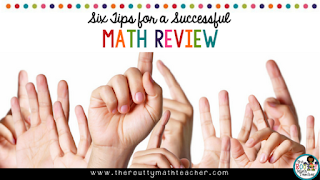 Head on over to The Routty Math Teacher website and read my latest post, "Six Tips for a Successful Math Review" where I share tips for a great review and some of my favorite review strategies. Read the post here or by clicking on the image below.